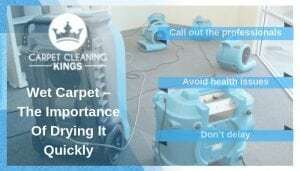 If you’ve ever woken up or come home from work to find your carpet soaking wet following a burst pipe or a flood, then you don’t need us to tell you what a pain it is to dry everything out again and return your home to some semblance of normality. Sometimes your carpet is so badly damaged by water that the only solution is to replace it. However, with the help of professionals to dry and clean it, many times your carpet can be salvaged and treated so that it’s safe to keep it. It’s easy to panic after a flood and assumes you have to dispose of your carpet. But don’t do that right away – instead, enlist the help of a reputable company who deals with flood water damage. Instead of letting the carpet dry on its own, do yourself and your carpet a favour by getting it dried quickly and professionally. That way you know you’ve done all you can to try and save your carpet before it gets to the stage where there is no option but to bin it. If you don’t have your carpet dried quickly, then there’s every chance that it will develop mould and mildew and will need to be replaced. Not just that, but bacteria can be left behind which can cause health issues to your family in the long term. By calling out the professionals when your carpet/s are drowning in water, they will be able to assess the damage and do their best to rescue the situation. Many homeowners try to dry out their carpets themselves and think they have succeeded because the carpet does indeed look and feel dry. However, the truth is that most times the carpet is still wet right at the bottom of the fibres and on the padding beneath. Speed is of the essence as far as water damage is concerned, and you’ll be pleased to know that we operate a 24 hour service, every day of the week, which means we’re always here for you, and will respond within 45 minutes. Our powerful machinery means we can extract ALL of the water from your carpets and upholstery and dry everywhere out using dehumidifiers, air filtration devices, and air movers. 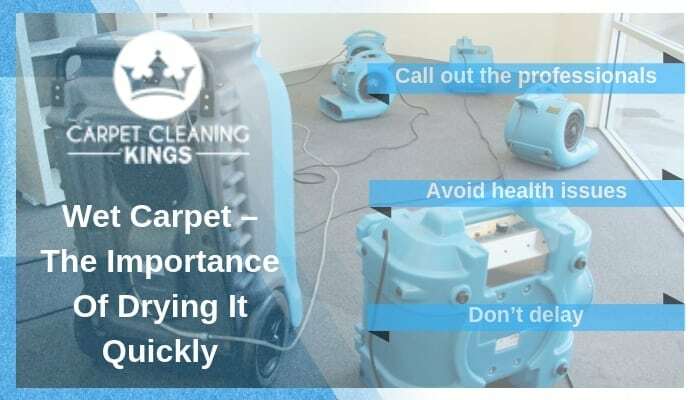 Once your carpet is thoroughly dried, we’ll give clean it using a hot water extraction method, at the same time sanitising and deodorising it to ensure that it’s totally free from germs and bacteria, and safe to continue using in your home. Flooding is a horrible thing to happen but isn’t it good to know that help is no more than a phone call away? Meanwhile if you need your carpets cleaning or would like a free quote, then please contact Carpet Cleaning Kings on 1300 7000 75.